Manchester City have finalised the signing of Netherlands international Nigel de Jong on a four-and-a-half-year contract from German club Hamburg. The 24-year-old has moved for an undisclosed fee after agreeing personal terms and passing a medical. However, German media reports that Mark Hughes's side may have paid as much as £18m to sign him. The midfielder had a clause in his contract that would have allowed him to leave Hamburg in the summer for £1.8m. "It all happened a week ago, the clubs agreed everything in two days," De Jong told BBC Radio Manchester. "After that I agreed personal terms and here I am on my way to the training camp in Tenerife." 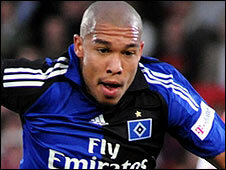 The Dutchman has played 66 Bundesliga games for Hamburg after joining from Ajax for £1.2m in 2006. And De Jong, who was out of contract with Hamburg in 2010, said that it was his former Hamburg team mate and current City midfielder Vincent Kompany who helped him decide to join the club. "I played with Vincent Kompany at Hamburg of course and he said some nice things about City. "We've kept in touch since he made his move here and when the rumours started that I might be moving to Manchester he contacted me and told me about the atmosphere, the fans and the people behind the club, which made it an easy move for me." The move sees De Jong join Wayne Bridge and Craig Bellamy at Eastlands as City's January recruitment list grows. Left-back Wayne Bridge was the club's first January signing, arriving from Chelsea for about £10m, while Bellamy joined from West Ham for a fee believed to be worth £14m. City's executive chairman Garry Cook said there could be more signings before the window closes. "We've got a couple of others that we're still working on and it's unfair to comment too deeply on those," Cook told the club's website. "We had very clear plans going into [the transfer window]. We're ticking the boxes as we say." Cook also insisted that, despite missing out on signing AC Milan star Kaka, the club had a long-term plan in place. "Over the next four [transfer] windows we have got a clear list of players we would like to see at this football club," said Cook. "We choose not to get into the public space, which allows itself to be speculative, but we clearly know what we're doing - and I think that the fans are going to be excited." City lie 11th in the Premier League table but only four points above the teams in the relegation zone.